For Christians, eschatological “time” and “space” are our time and our space transfigured by the glory of Christ. We use quotation marks to speak of time and space for the following reason: since our words describe the reality of our world, they lose some of the relevance when we try to talk about what goes beyond our experience of the world. This is why poetry, parables, and image language are better suited for talking about the end time than discursive, rational, scientific language. All the eschatological passages of the Bible, especially those of Daniel and Revelations, use verbal imagery that seems, to our far-too-earthly eyes, very close to pure fantasy. We can easily see that every word that tries to express the reality of the Kingdom of God must necessarily be deformed and stretched toward imagery so as to perceive “through a mirror dimly” (1Cor.13:12) that which we only know by foretaste. The same conditions apply to the icon but are expressed in a different manner: the icon has the task of representing, making visible, people and events in the light of the Kingdom of God. Such persons lived, such events took place in history, our history, according to the conditions that govern our existence, but they allow us to glimpse a reality which is not ruled by those conditions. Iconography, therefore, must use material and techniques that belong to our world (colors, lines, brushes, little colored stones, etc.) to show forth the Kingdom of God. The icon’s relation with the word is once again brought out: What poetry and parables are to the ear, iconography is to the eye. Since the goal of iconography is to paint in the light of the Kingdom of God, where the old heaven and earth have disappeared and where all is new, it is not surprising that the iconographer should not try to reproduce the world as we know it on our side of the Second Coming of Christ. In this sense, iconography is not a “naturalistic” art whose raison d’être is to copy beautiful nature. Our world, finally, is not at all “natural” because it is deformed by sin and bound by death: two powers, conditions, that did not exist in the Garden of Eden are described in the first chapters of Genesis. Our human experience is set between two poles: the first one is the Alpha, “In the beginning...” Paradise, where death and sin had no place, where Adam and Eve were naked and felt no shame, where the first parents did not kill to eat, where all was in harmony, where God and man spoke directly and lived in perfect communion. We should pay attention to the image language, the utopian description of Eden. Because we have no direct experience of this beginning, the biblical author was forced to reverse the conditions of our world in order to describe an existence about which we only have the vaguest intuitions. The second pole is the Omega, the end, “the End of Time,” when Christ will establish his Kingdom in fullness—though again, we only have a foretaste of it. In order to attain their objective, icon painters “twist” the principles of naturalistic painting (proportion, perspective, linear time, etc.) so as to suggest the irruption of a new reality into our world. Through iconographic techniques, the painter represents people, events, animals, plants, landscape, that we recognize as elements of our earthly existence, but which are nonetheless bizarre; they are arranged in a strange setting. It is by this strangeness that the icon indicates the newness of the heavenly Jerusalem, the Kingdom of God where we recognize our world, but not quite. Several examples can help us see the tension between the necessity of representing the Beyond with the means of the Here-and-Now. 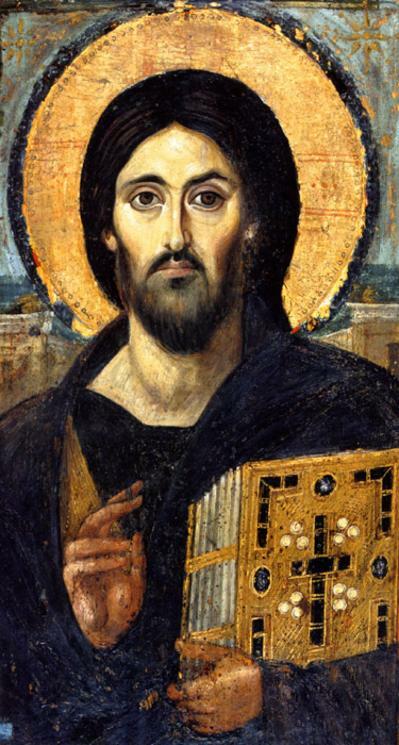 Normally the background of an icon should be painted in gold, real gold or a golden color. The person or event painted is represented already in the Kingdom, bathed in its light. Gold is the most shining color, the richest; it is that earthly matter that best reflects the brilliance of light. And since the heavenly Jerusalem, according to Revelations, is made out of “pure gold,” and having “no need of sun or moon to shine upon it, for the glory of God is its light,” it is quite proper for the background of an icon to be of a golden color so as to reproduce the effect of being immersed in a blinding light. A golden background also establishes an unlimited framework in which the persons and events are set. It gives the impression that the subjects in the image are not in a spatial and temporal setting but rather float in a transspatial and transtemporal milieu. A naturalistic, realistic background would eliminate the sense of the presence of the divine light; the breaking through of the Kingdom into our world would be diminished. The tendency of some contemporary iconographers to paint a black background, or one so dark in color that the psychological effect is the same as black, must be seriously challenged. Black is the color of death, sin, and darkness and diminishes the blinding effect of light. We have yet to hear a convincing justification of this tendency of substituting the brilliance of God’s Kingdom for the somberness of Satan’s. According to the principle of naturalistic painting, the proportions and perspective of our world should be reproduced as faithfully as possible. If not, the public thinks it is looking at a surrealistic or symbolic work. A person in an icon, on the other hand, does not have the normal proportions of a human body. He is “stretched” and “thinned out” so as to increase the impression of being without weight or volume; nonetheless, the figure is clearly a human being, a man or a woman. We can easily identify buildings, trees, rocks, animals, etc., but they are different. If in nature as we know it lines come together as they move toward the horizon—railroad tracks, for example—the lines of perspective in an icon are often inversed and seem to come together in front of the image, in the person who is looking at the icon. (Several kinds of perspective may also be combined in one image.) The observer becomes the observed; the person in the icon is really the one doing the looking. In our earthly space, we normally look at paintings, but in heavenly space, into which the icon is a window, we become the object of someone else’s gaze. Linear time to which we are all accustomed—that is, the present following the past and preceding the future, a movement that allows no exceptions—loses its tyranny over us in iconic time. Two events separated in historical time can be shown on the same icon without any indication of temporal separation. The icon of the Protection of the Mother of God, October 1, combines two events in such a way that those who do not know how to read it think they are looking at one scene. In the upper two-thirds and in the lower right corner, we see St. Andrew the Fool in Christ and his disciple Epiphanius (Constantinople, 10th century) as well as the apparition of the Virgin seen by them (fig. 3). In nearly all the space of the lower third of the icon, we see Romanos the Hymnographer (6th century) who is shown singing and directing the choir. In the calendar, the two events are celebrated on October 1, and this explains why both events are shown on one icon. 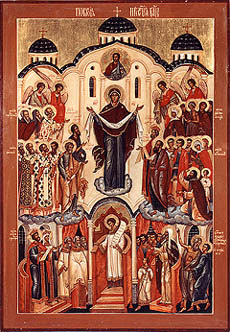 The Pentecost icon as well as that of the Ascension-also have a transtemporal quality because they are as much theological as historical. In both, St. Paul is represented event though at the historical moment represented on the image he was not even Christian. Icons can sometimes “twist” history by including St. Paul because they are at the same time images of an historical even and theological images of the Church. In an image purporting to illustrate the New Testament text of Pentecost, St. Paul has no place, obviously. In an icon of Pentecost, however, whose base is the historical event but which also transmits a transtemporal, theological interpretation representing the inner life of the Church, he has an eminent place. In these two feasts, the theological element is added onto the historical base. 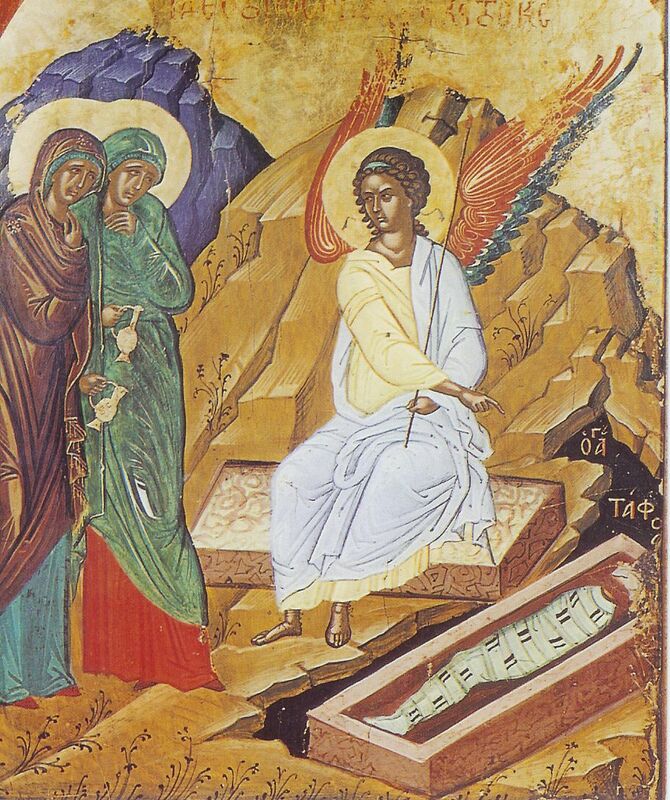 It is rather rare, and a corruption of the canonical iconographic tradition, to have an icon of Pascha showing Christ coming out of the tomb (fig. 4). An icon of the historical event of the resurrection shows the myrrh-bearing women going to the tomb where they meet a shining angel seated on the stone near the rolled up burial clothes (fig. 5). The resurrected Christ is not represented. 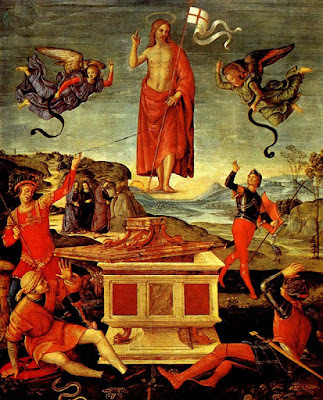 The other traditional image of Pascha is the Descent into Hell in which Christ, surrounded by Old Testament characters, raises Adam and Eve from their tombs. The event itself is rather that of Holy Saturday when Christ goes to the “land of the dead” to announce the resurrection, but in fact this icon shows the resurrection of all humanity at the end of time, not Christ’s specific resurrection. What we celebrate in the flow of linear time, after 2000 years of history, is the resurrection of Jesus of Nazareth around the year 33 and represented in the image of the myrrh-bearing women who were also living in the succession of historical moments. As for us, we must wait for the future moment when Christ will come again. On the other hand, for those who are no longer in the flow of time, those who have died in Christ, who are in a state where everything is the eternal present, the historical resurrection of Christ is already the Resurrection of the eschaton, of the End of Time. From Heroes of the Icon.